Topological Mesh Modeling is an umbrella term that covers all my work based on extensions the theory of graph rotation systems. It includes (1) Orientable 2-manifol mesh modeling using graph rotation systems and its computer graphics applications, (2) Knot modeling with immersions of non-orientable manifold meshes and (3) Topological constructions that is based on geometric and physical constraints with graph rotation systems. We recently started to work on immersions of 3-manifolds as a representation to develop shape modeling systems. This particular submission is related to topological Constructions based on Discrete Gaussian-Bonnet theorem and Gaussian curvatures related mesh topologic concepts to geometry. Using this relationship, we have developed methods to physically construct shapes. 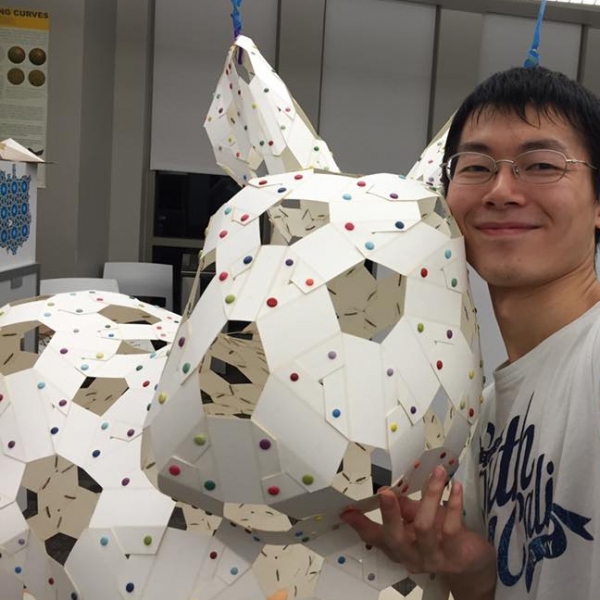 This is the video of the paper that is recently accepted Shape Modeling International Conference and it will be presented in Geometry Summit in Berlin. The Paper will be published in Computer & Graphics journal, which is one of the leading journals in Computer Graphics field. In this particular work, we demonstrate that quad-edge mesh data structure can efficiently be used to construct large shapes. We have developed a system to unfold any polygonal mesh based on quad-edge structure. Using our system, any shape can be constructed by using laser-cut developable panels. This approach is particularly suitable to construct complicated sculptural and architectural shapes from anisotropic materials that can only be bent in one direction.